There may have been some eye-rolling when the Hamilton Tiger-Cats announced last winter that Jerry Glanville, age 76 and with no CFL experience beyond a guest-coaching role during training camp in 2017, would be the team’s new defensive co-ordinator. After all, the history of NFL coaches transitioning to the CFL isn’t good. And how much energy would a 76-year-old bring to such an important job, anyway? Well, no one is wondering about those things these days. Not with Glanville’s defence ranking at or near the top of most statistical categories heading into the final few weeks of the season. It’s a unit that has been particularly stingy when the opposition puts the ball into the air, having surrendered just one 300-yard passing game all season. Not bad for a guy who’s had to learn so much on the fly this season. And as for whether he’s got enough energy for the job? Part of that football intelligence is rooted in his obsessive nature when it comes to the game. Glanville carries a spiral notebook with him at all times, including when he goes to bed, and is often prone to middle-of-the-night scribbling sessions that spill out of his brain without warning. Does he ever stop thinking about football? “Never,” he says. “I don’t even talk to people about anything other than football. I’ve never had a conversation with [Hamilton head coach] June Jones that wasn’t about what we’re doing with football. I don’t golf. I’m not a guy who you’re going to ask where you eat or what you do on your day off. On my day off I have a spiral notebook and I’ll be drawing-up plays. That’s who I am. Glanville’s life in football has taken him all sorts of places, and allowed him to cross paths with people within the game and beyond, many of whom have connections to today’s CFL. He was on the Atlanta Falcons coaching staff in the late 1970s and early ‘80s when Jones was there as a player. He was with the Houston Oilers when Steve Tasker, the son of Ticats receiver Luke Tasker, was also on that team. He coached with Joe Popp, the late father of Toronto general manager Jim Popp, at Georgia Tech University in the 1970s. And when he was coach of the Atlanta Falcons, Jessie Tuggle, the father of Argo defensive lineman Justin Tuggle, was one of his best players. He also drove the NASCAR and truck circuits for 15 years, raced hot rods and found himself in movie cameo appearances with such stars as Danny DeVito, Jack Nicholson and the late Burt Reynolds, along with playing himself in an episode of The Sopranos. But for someone who’s had to do a lot adapting the past several months, Glanville has his particular routines and ways of doing things. Part of his routine includes leading his defensive staff daily in either weightlifting or going for an outdoor walk, after which they eat as a group and then review film. Glanville says he’s rarely recognized in Hamilton, unless he happens to be out on one of those walks with his coaches. It’s a practice that has garnered some attention on the road as well, where on game days he’s happy to be a target for the home fans. It’s been a few weeks since the CFL announced it was loosening its restrictions on celebrations after touchdowns. But one thing we seem to be seeing more of is full-blown choreographed ‘cellys’ after interceptions, which the league is apparently fine with. Where there is an issue is when celebrations mimic the use of firearms, which why several Montreal players drew fines this week, just as Hamilton’s Frankie Williams did recently. The critical play of Saskatchewan’s 19-12 victory over Edmonton on Monday occurred when Esks quarterback Mike Reilly threw an interception into the hands of Roughriders defensive lineman Willie Jefferson that went for pick-six. Eskimos head coach Jason Maas challenged that Saskatchewan’s Zack Evans had made contact with Reilly’s head and thus a roughing-the-passer call should have been assessed. The play stood and the Esks, miffed, asked for a review by the league following the game. It’s certainly clear why some might have viewed the need for a penalty on the play. But it’s also fair to suggest the play stood in part because of the league’s emphasis on only turning over plays in which there is indisputable evidence. A year ago, the CFL was accused of using the replay booth to officiate games, not correct mistakes. That’s meant a higher standard for overturning calls or non-calls on the field, which is what appeared to occur in this case with Reilly. Long before this weekend’s drama over B.C. general manager Ed Hervey’s comments about quarterback Jonathon Jennings, the perception around the CFL was that Jennings days on the West Coast would be done at the end of this season. Ghahremani, understanding that Jennings is likely to be on the open market this winter, was upset that Hervey’s comments could impact his player’s standing with other teams. Meanwhile, Hervey didn’t back down, asserting that he was giving an honest of assessment of where Jennings is in comparison to the league’s elite quarterbacks. Jennings and Hervey apparently spoke one-on-one earlier this week, but it’s hard to imagine this relationship extends beyond this season, especially with Travis Lulay about to get the starting job back. Given the acrimony between Hervey and Ghahremani, the question now becomes how much this might affect his other clients on the Lions, which include running back Jeremiah Johnson, receiver Manny Arceneaux and linebacker Solomon Elimimian. Elimimian is signed for next season, the others are not. There were two trades made before Wednesday’s CFL trade deadline that included four players, all of them Canadian. Three of the players dealt will be free agents at the end of this season. Montreal traded Canadian linebacker Chris Ackie to Ottawa for a second-round pick in 2019. Ottawa had been in the market for a starting Canadian to help with their ratio and they get that in Ackie, considered among the best homegrown players at his position. Montreal also dealt offensive lineman Philip Blake and fullback Patrick Lavoie to Saskatchewan for receiver Josh Stanford and a second-round pick in 2020. Getting two Canadians who can start right away, including one in Blake who is signed for next season, seems like a lot – especially given that Stanford can become a free agent after the season. It’s curious that the Toronto Argonauts opted not to make any deals. The Argos listened but weren’t willing to trade any of their pending free agents for late-round draft picks and weren’t interested in trading anyone they have under contract for next season. The biggest move of the day, however, may have been made by the Hamilton Tiger-Cats who added receiver Terrell Sinkfield, a former CFL receiver with three teams, who’d been playing defensive back in the NFL. 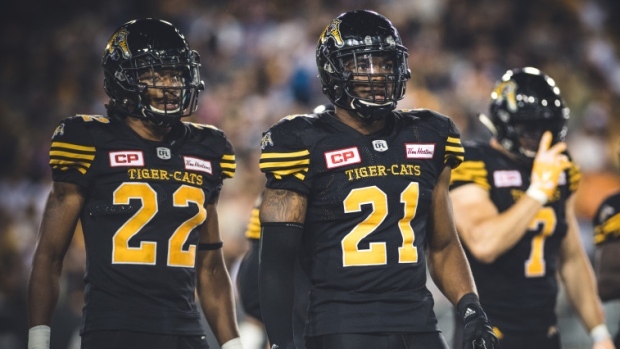 The Ticats, who lost import receivers Chris Williams and Jalen Saunders to season-ending injuries, love speed in their unit and Sinkfield, who will also return kicks for Hamilton, provides a jolt of that for the final few weeks of the season.